Photo by Alan Tahler / Brandon Reed drives hard to the basket in Tech’s 66-60 victory over the University of Virginia. Reed only played seven minutes against Virginia, but scored nine points against Florida State. Arguably the most exciting game of the season was won by Tech on Sunday, after overcoming a nine point halftime deficit against the Virginia Cavaliers. The Jackets, led by senior guard Mfon Udofia with 15 points, arguably put forth their best effort of the season and played a complete 40 minutes, much to the delight of head coach Brian Gregory. “For us to tough out the win, it was a good sign,” said Gregory. Gregory later cited Virginia as one of the top performing teams in the ACC at the moment, next to Miami. Virginia was 5-2 in conference play entering Sunday’s game and on a four-game conference win-streak, including recent wins over Florida State and 19th-ranked North Carolina State. Needless to say, the Cavaliers were the road favorite to win the game and looked to be heading to their fifth consecutive win at the half, when they led the Jackets by a score of 37-28. In the locker room at halftime, Gregory’s message was simple: he still had faith in the team to win the game. “I told them, we’re going to get this game into the last two minutes… we’re going to win this game in the last two minutes,” Gregory said. Tech responded to their coach’s confidence and came out swinging in the second half, setting the tone for the next twenty minutes with a quick 9-3 run featuring the freshman trio of forward Robert Carter Jr. and guards Marcus Georges-Hunt and Chris Bolden, to cut the Cavalier’s lead down to 40-37. The Jackets continued to hang with Virginia for a majority of the half, never letting the Cavaliers get any further away than nine points yet never getting any closer than two. With 3:45 remaining, Bolden hit a jumper to knot the game at 57, and put the Jackets in position to close the game out. From there on, it was all white and gold. The Jackets ended the game on an 18-3 run, in which they shot seven for 10 from the free throw line. The Jackets strong finish allowed them to earn their second ACC home win with a final score of 66-60. 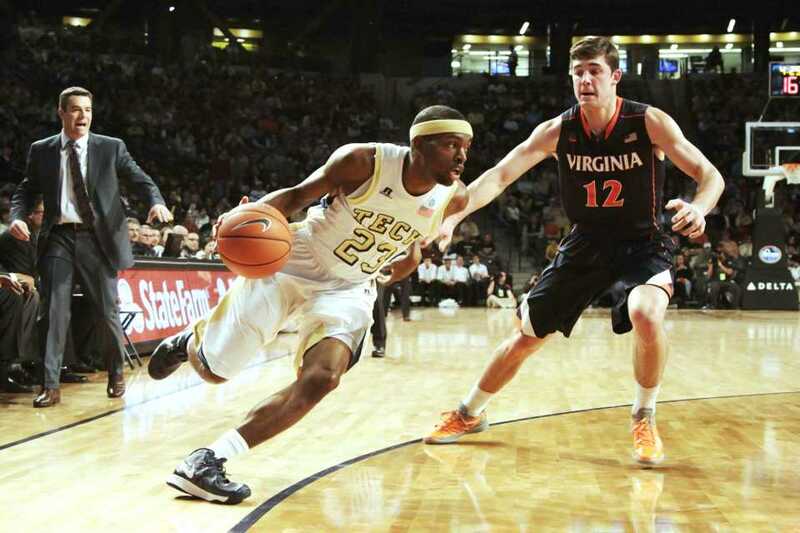 Just two days later, the Jackets hosted the Florida State Seminoles at Hank McCamish Pavilion. Tech went scoreless through the first six and a half minutes of play and trailed 13-0. The crowd, while stunned, was not taken out of the game by this lapse in offense, and the crowd’s confidence allowed the team to get back into the game. After a Georges-Hunt jam for Tech’s first points of the game at the 13:37 mark, the crowd was in a frenzy. Tech showed its characteristic grit as it grinded out the first half, kicking things off with an 11-2 run. Redshirt junior guard Brandon Reed was automatic from long range, sinking three three’s in the first half alone. The Jackets, despite their slow start, went into the locker room with a 27-26 lead. Tech’s defense took over late in the half, prompting a 27-13 run to close the half. A dunk in traffic by redshirt junior center Daniel Miller gave Tech the lead in the final seconds. The Jackets built their lead in the second half, but ultimately wound up at a 47-47 tie with five minutes to go. Tech soon found itself in a five-point deficit a minute later, but was not intimidated. Udofia made a banked three-pointer at the one minute mark to tie the game at 54, and had a chance at a game-winner with 33 seconds remaining. However, Udofia could not capitalize. Florida State ran down the clock and converted a layup with one second left to seal the victory with a final score of 56-54. The Jackets will head to Blacksburg for a rematch against the Virginia Tech Hokies this Saturday, Feb. 9 at 1:00 p.m. and will return home on Thursday, Feb. 14 for a matchup with the rival Clemson Tigers.